Question: do you air down on those trails? If so. 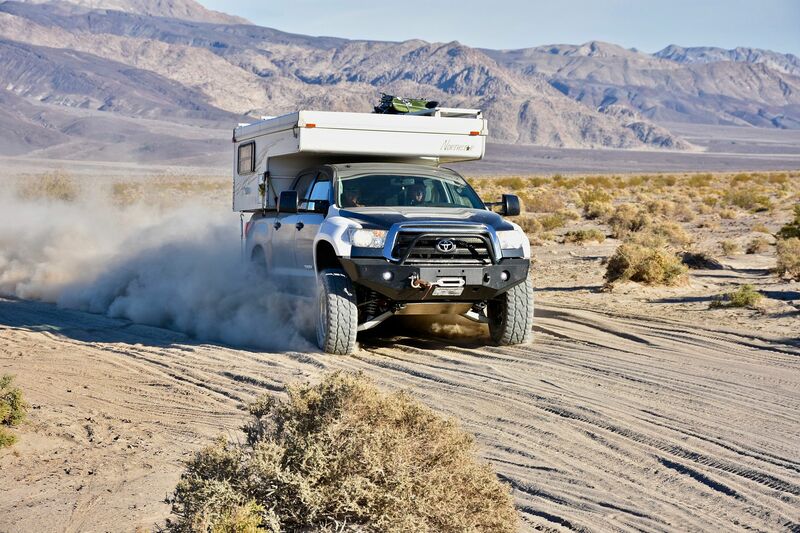 What pressure do you run with your camper on? I do. All the weight really increased the chances of a puncture or slash. I drop to 30psi unless it's deep sand, then 12psi gives mega flotation. Awesome. Thanks for the info. That question has been bugging me. One more. How much do you air down to without the camper? Id say about the same. It really depends on how loose you want to get. And changes with the conditions to a certain degree. If your going to be spinning donuts or really pushing thru corners, you don't want to be aired down too much or you can pull a tire bead off the wheel. But- going straight or normal driving conditions with loose, soft terrain, lower the better. Ie- sand/snow. Great photos and thanks for the update! Frying shells and La Victoria taco sauce is the only way I do it! Nice work. I was in Bishop last weekend to visit my Mom and met my Dad in Mammoth to ski for a day. In Tonik in the village? Wonderful pictures of your adventures. Thanks for sharing! we were in the Village for 11 years. Just moved (3 years ago :Wow1: ) our shop to Downtown, on Old Mammoth Rd. in front of Vons. 501 OldMammoth Rd. Nicer shop with much better parking. I've enjoyed watching your Tundra progress over the years. My 2016 Tundra is hauling a 4 wheel camper and just passed 45k miles. Lots of adventures. However, it was brought to my attention that the transmission cooling (with tow package) isn't great. It runs hot. Have you looked into this? Have you added any additional cooler? Changed transmission fluid? Mine was dark with on 45k miles and it's a 2016. Now, I'm looking into IPT valve body and improved cooling. I'll be in Mammoth this weekend for the MX race. I'll have the camper for convenience at the track, but need a shower and hot tub to be able to make it through the weekend. I'll actually be at a condo right near the Vons. I heard you had some more snow this past Sunday. Hope it melts by then . all melted! Weekend is looking amazing for Racing. Stop by the shop and say Hi, Im not one to hang around the shop and ooggle at everyone trying on clothes, but sometimes I'm in. Wife lives there of course. Might get out to the track this weekend, what class you racing? Copy the hot tub after a day at the track! Good times have been occurring, of course! Been upgrading the Tundra in a huge way (really just changing things around, it worked great but i wanted MORE !!) Check the build for that info. Getting ready for some more GOOD times! 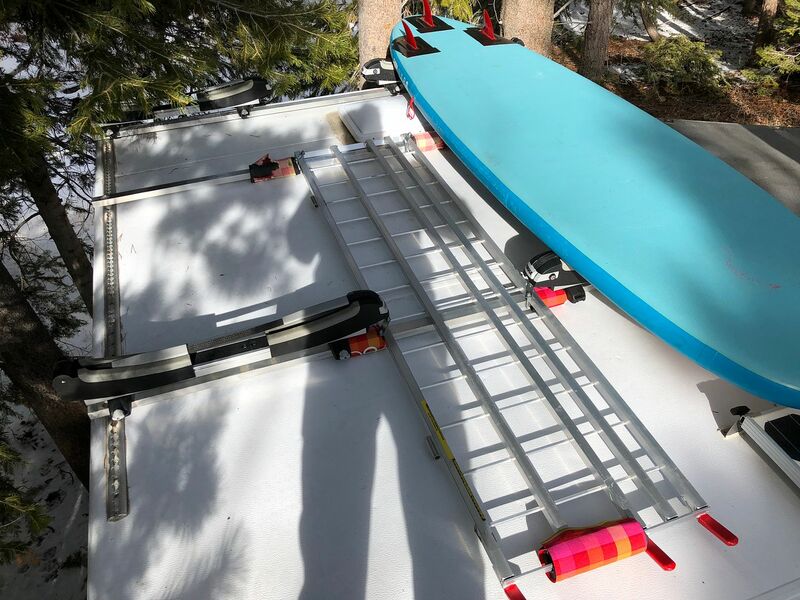 Dual paddle board racks are a key step in the setup!